Although icicles can add a beautiful, picturesque winter look to the outside of your house, the reality is that they can also be quite dangerous to your family, pets, and structure of your home. Whether for safety reasons, to prevent strain on gutters, or even for the satisfaction of knocking them down, many of us are tempted to remove icicles ourselves. 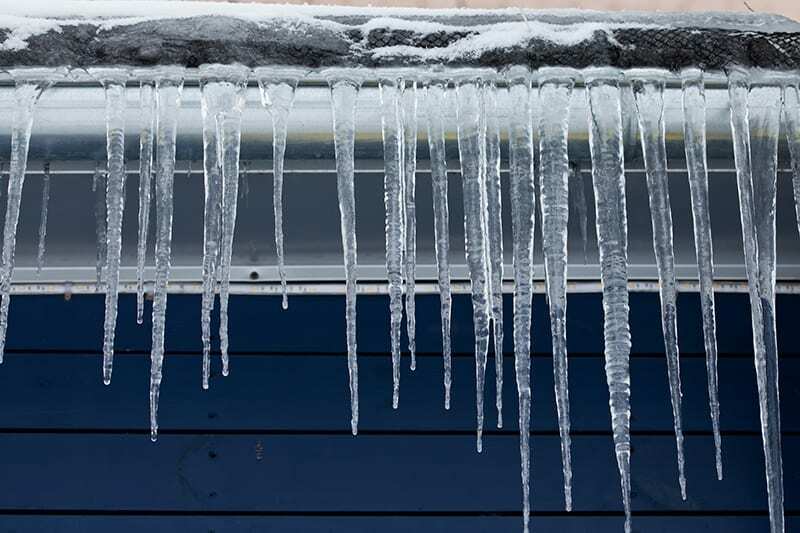 Before proceeding, you should know what risks come with removing icicles from your gutter yourself. Why Do Icicles Form on Gutters? Icicles form on gutters when excess water is not allowed to flow freely through the gutters. In the winter, the heat inside your house will often keep the roof warm, causing snow that has gathered there to melt. As the snow melts, water flows into a cold gutter, gathering there, and spilling over the sides, forming icicles. Ideally, this running water would follow the course of the gutter and down the rain spout. But if your gutters are clogged with blockages such as leaves or dirt, the extra water tends to run over the sides, which, in freezing temperatures, causes icicles to form. How Do I Prevent Icicles from Forming? If you’re trying to prevent icicles from forming, the most reliable method is to keep the gutters free of debris, including leaves, pine needles, and dirt. An unobstructed gutter will keep water moving freely down the rain spout, rather than spilling over. As mentioned, excess snow on the roof is the source of the water that freezes into icicles, so no snow on the roof means no icicles. However, we strongly caution against you cleaning snow off your roof yourself. Falling snow can be heavy and dangerous, and climbing onto your roof should always be done with caution. The long-term solution which can prevent the creation of ice dams and icicles is to have a professional check the insulation of your roof for leaks. The running water that comes from melting snow is often caused by a combination of solar heat and heat escaping through your roof. This escaping heat might be the result of insulation not functioning properly. In addition to the icicles you see hanging from the side of your house, another problem homeowners face in the winter is the formation of “ice dams.” Ice dams are gathered ice, either at the gutter or soffit, which, like a dam, traps water behind it, where it pools up on your roof causing unseen damage to walls, ceilings, and insulation. What Dangers Do Icicles Pose? Falling icicles present a risk to people and pets walking beneath them, as the icicles will often fall at unexpected moments. 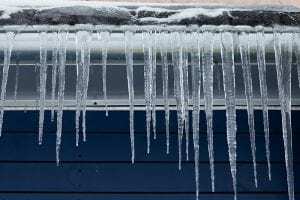 In addition to this, though, there are unseen risks to your home that come with the presence of icicles in your gutter. The weight of trapped ice in your gutter can damage the gutter or rip it away from the side of the house completely. Water that is trapped on your roof can and potentially weaken your roof, loosen your shingles, or causing leaks to the interior of your home. Should I Knock Icicles Down Myself? There are several risks to knocking icicles down yourself. The first of these is that falling ice can act in unpredictable ways, and in trying to remove it, you run the risk of injuring yourself or others. Another risk is the icicles tearing the entire gutter away from the side of the house. In addition to this being a bothersome and costly repair, the lack of gutters, especially in the middle of winter, can cause further problems. 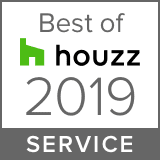 After all, gutters exist to channel the flow of excess water, and without them, both cosmetic and structural damage can be done to your house. Should I Hire A Contractor To Treat Large Icicles In My Gutter? Proper removal of icicles from a gutter should be done from the roof of your house. There are risks involved with working on your roof, especially in icy conditions. Our roofing experts are used to these risks and can not only remove existing icicles but prevent them from forming in the future. Contact DryHome Roofing and Siding for a consultation today, and let us figure out how to solve, or better yet, prevent your icicle problems in a way that’s safe for everyone!